In first grade at All Saints’ Day School, our curriculum is designed to help children develop strong academic habits, build caring relationships, and foster independent thinking. As full-time students, first graders are included in every aspect of school life and they are active participants in all that our beautiful campus has to offer. While homeroom classes are devoted to building a strong foundation in reading, writing, science, and mathematics, the children also work daily with master teachers who share their expertise in art, foreign language, music, physical education, technology, and religious studies. The tradition of our rich curriculum and nurturing community work together to develop the academic practices and social skills that will serve our students during this very important first year as well as the years ahead. In first grade, heavy emphasis is placed upon phonics, decoding, fluency, spelling and the memorization of sight words. Students work daily on building skills in reading comprehension, accuracy, and vocabulary expansion. 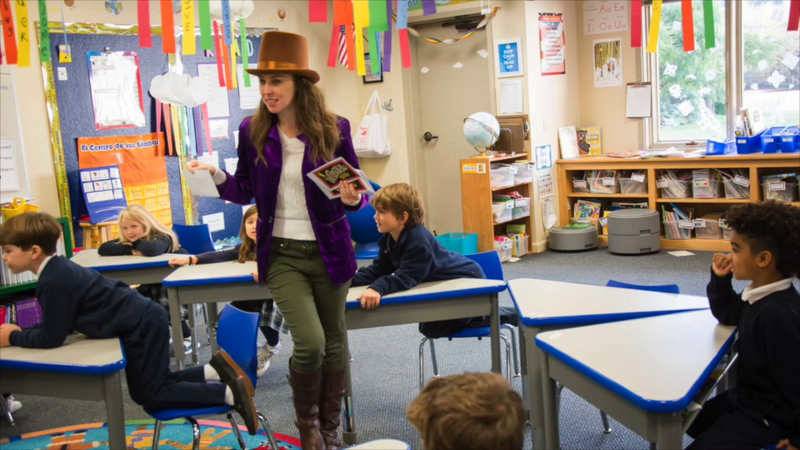 Literature studies on the novels Stuart Little, Charlie and the Chocolate Factory, The Story of Dr. Dolittle, and Matilda provide many opportunities to explore character development, plot, predictive and inferential reasoning, and rich vocabulary. Students complete 20 differentiated spelling units that are designed to reinforce phonetic strategies, sound blends, and help develop test-taking skills. Small reading groups and differentiated homework assignments reinforce lessons taught in class. Weekly grammar lessons emphasize punctuation and sentence formation. Finally, students complete the first grade Handwriting Without Tears printing program. Upper and lower letter formation are practiced daily with the appropriate letter spacing. By the end of 1st grade, students have gained an understanding of number sense, measurement and geometry, and mathematical reasoning. Through daily lessons, games, and songs students learn the value of numbers to the 100's place, add and subtract small numbers with ease, measure simple units, describe data, and analyze and solve simple problems. Creating, writing, and solving world problems help students explain their work and share their ideas with others. The science program provides experiments and activities that will increase the students' awareness of their environment, stimulate their curiosity, and develop their ability to think critically. They learn to observe, describe, identify, and compare information while studying sound, light, plants, mammals, and space. Each unit of study additionally provides unique cross-curricular collaboration opportunities, including through music, art, library research, and language arts. The health curriculum focuses on making good and healthy choices. Students identify a variety of behaviors that promote healthy growth and development. Students are enrolled in Spanish beginning in the first grade. The focus in lower grades is placed on developing oral communication and conversation skills. Songs, stories, games, poems, and props are used to encourage children to participate actively in speaking the language. T.P.R. (Total Physical Response) Storytelling, a method that permits immediate comprehension of the input as students listen to and mimic the phrases in the target language, is used in grades 1 - 5. Students enact dialogues and readings, focus on conversational skills and expand their knowledge of Hispanic countries through poetry, songs, and readings. In first grade Spanish a broader variety of vocabulary is introduced through songs and games. Students learn about animals, days of the week, months, the weather, seasons and more. Social studies in 1st grade begin with the broad concepts of rights and responsibilities in the contemporary world. The classroom serves as a microcosm of society in which decisions are made with respect for individual responsibility, for other people, and for the rules by which we all must live: fair play, good sportsmanship, and respect for the rights and opinions of others. They begin with a study of self, which leads into a unit on the family and its needs. Students practice rights and responsibilities of citizenship in school. They additionally use maps and globes to locate California, the United States, the seven continents, the four oceans, and their own hometown. Students also spend a week studying Japanese culture and customs as a part of International Week.